published May 26th 2011 by Saga. You may or may not have heard about our recent winter Scavenger hunts taking place all over the western US, where ever we went we made sure to leave a few things behind for the dedicated Angus follower. Continuing into this summer we will be running as many Saga Scavenger hunts as possible and with that comes a slight change into the format of how we do the posting of prizes. From now on we will announce the start of the scavenger hunt on Facebook but will only post the prize locations on Twitter. You can easily add the Twitter app to your smart phone or access it via the web, trust us when we say this new posting system is a lot more efficient, a lot. If you need to start a twitter account click here and for smartphones click here. 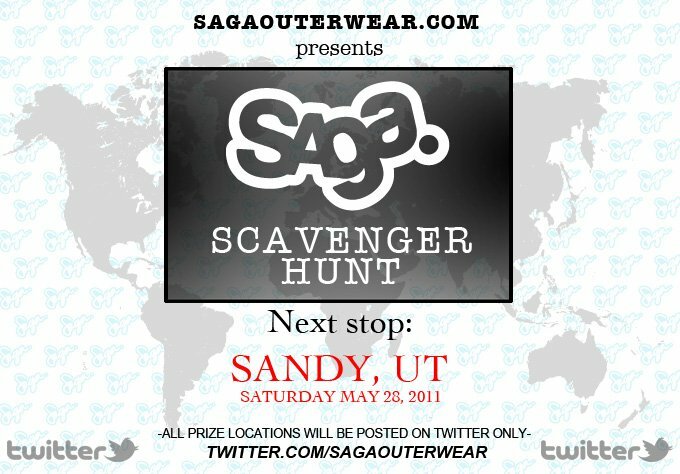 Our Twitter account is twitter.com/sagaouterwear. Hopefully coming to a town near you! Next stop, Sandy, UT. In December 2017, Saga's warehouse was robbed. Thousands of Dollars-worth of products were stolen. Saga's Co-founder/Ceo, Andy Mallett, tells us the story and tells us how they've recovered and even improved after the heist!